Family Storytime honoring Dr.Martin Luther King, Jr.
Every Tuesday evening I am responsible for a family storytime for about 50-60 people, ranging from babies and toddlers to school-age children to parents. It's a valuable opportunity not only to entertain and encourage a love of reading, but also to (hopefully) teach something to the audience. This year I had my second annual Martin Luther King storytime. Dr. King's life and legacy do not lend themselves easily to a crowd of this diversity of ages, but fortunately there are many wonderful books on Dr. King out there to choose from, and more are published each year. 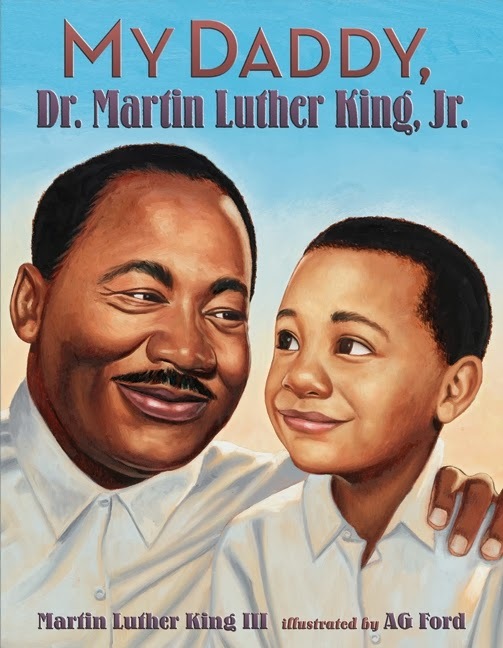 My Daddy, Dr. Martin Luther King, Jr. by Martin Luther King III is a recent (2013) release from Harper Collins and a welcome addition to the King bibliography. Only 10 when his father was killed, "Marty" tells about what it was like to grow up with the famous Dr. Martin Luther King Jr. as your father, in a way that's immediately relatable to children. For example, he and his siblings were begging to go to Funtown, a local amusement park, but Dad never would take them. We then learn that Funtown was open only to whites. His dad was often away, but when he was home he liked to play airplane with Marty, even lifting him on top of the refrigerator (parents, don't try this at home). We see King as a warm, caring man who loved his family. But it wasn't easy to be the son of this great man, and sometimes Marty was afraid to tell kids at school his name, because he knew that his father was hated by many people, even though he never hurt anyone or committed violent acts. At Christmas he and his brother were given toy guns as a gift (we aren't told by whom) but they are made to burn them in a bonfire since guns, even toys, were not permitted in their house. The book ends on a hopeful note with Marty and his sister helping to integrate a local school. An afterword tells of Dr. King's death and speaks briefly of his legacy. 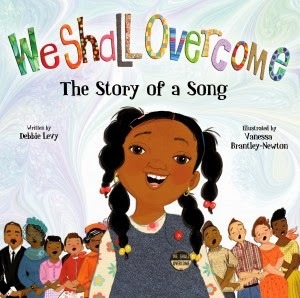 We Shall Overcome: the Story of a Song, by Debbie Levy (Jump at the Sun, 2013) is another new release which fits perfectly with Dr. King's birthday. This is not the first children's book devoted to this song, but is the one best suited to be read aloud to young audiences. Unfortunately the book doesn't come with a CD, so I used one of Pete Seeger's versions to play for the audience. 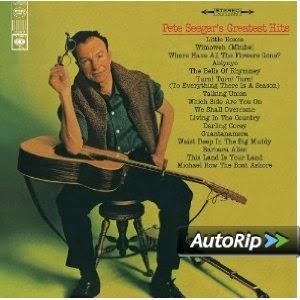 The version I used is from Pete Seeger's Greatest Hits, and was recorded live in concert with a huge crowd singing with him in the background. The book traces the history of the song from slavery days to the present, including how the song was instrumental in the civil rights movement. We see Pete Seeger singing the song for Dr. King, we see President Johnson quoting the words from the song in a television address, how the song spread to different countries fighting for freedom such as South Africa and China, and how the song was sung at the inauguration of our first black president. The book presents a message of hope combined with colorful illustrations which enhance the message of the book. Dr. Martin Luther King is well known for preaching a message of nonviolence and peace, but peace is not an easy concept to explain to young children. I chose to also share beloved children's author and illustrator Todd Parr's book on the subject: The Peace Book (Little Brown, 2009). Each spread offers a different definition of peace, from hugging a friend to keeping the streets clean. 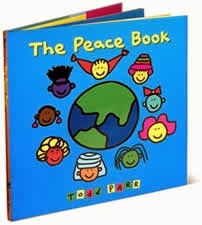 The book ends with a celebration of diversity: Peace is being who you are, with Todd Parr's signature children depicted in various primary colors. Did you know that Dr. King's favorite dessert was pecan pie? And I bet you didn't know that two 11" pies can serve 50+ people--just dish spoonfuls of the delicious mixture into cupcake holders, top with a dollop of whipped cream (or Cool Whip), and voila, you can stretch two pies an amazing distance! Everyone (except a few with nut allergies) relished the delicious treat. After explaining that the dove was a symbol of peace, we concluded with an art activity in which we had prepared a white template of a dove, pre-glued it on blue paper, and provided do-a-dot paints for the children to use to decorate the bird. Have you done storytimes on Dr. King? Please share your favorites in comments below!